There's a salon for HARE cuts with the image of a hare about to be decapitated! 1. The oven brand in the opening scene is called, "Hotternell," HA! Ya know, like, "hotter than hell?!" That definitely did not register in my child-like brain as a kid. 2. And the "director" of the film, Raoul J. Raoul, is played by IRL famous film producer Joel Silver. Silver is best known for action-heavy movies like The Matrix trilogy, the Die Hard franchise, and the Lethal Weapon films. 3. A bunch of cows are lined up in front of a sign that says, "Cattle Call" — which is an old-fashioned Hollywood term for casting auditions. 4. 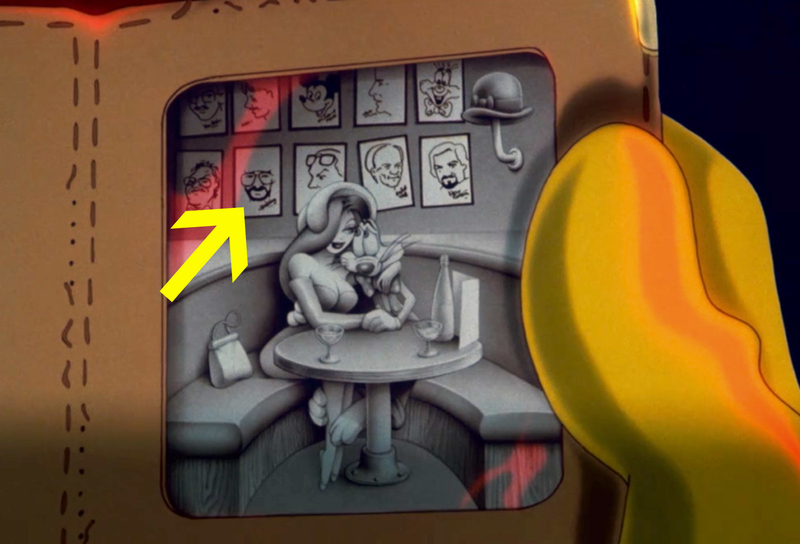 Steven Spielberg, one of the film's producers, makes an animated "cameo" — you can see a drawing of him in the background of the third photo Roger has in his wallet. 5. 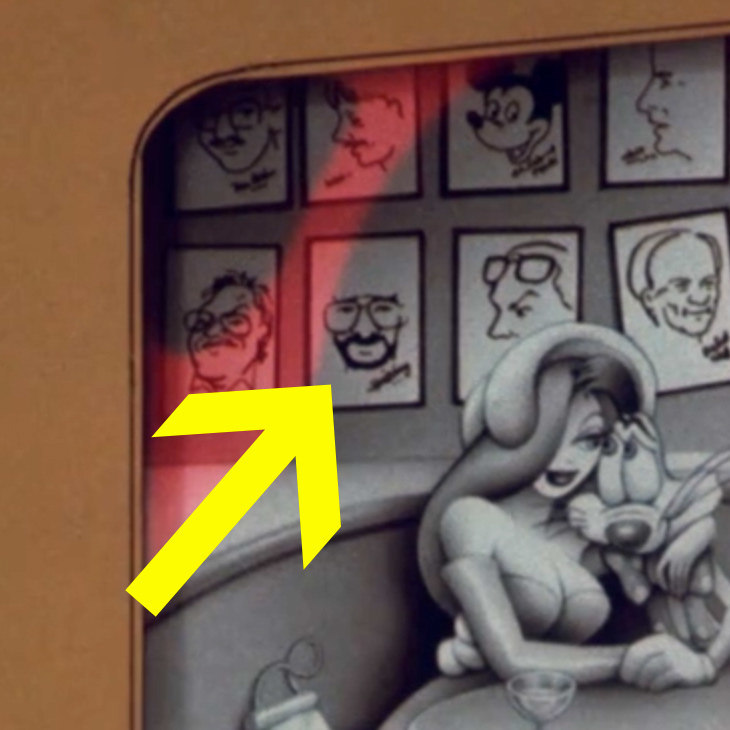 There's also a "hidden Mickey" on the same wall above and to the right of Spielberg. 6. 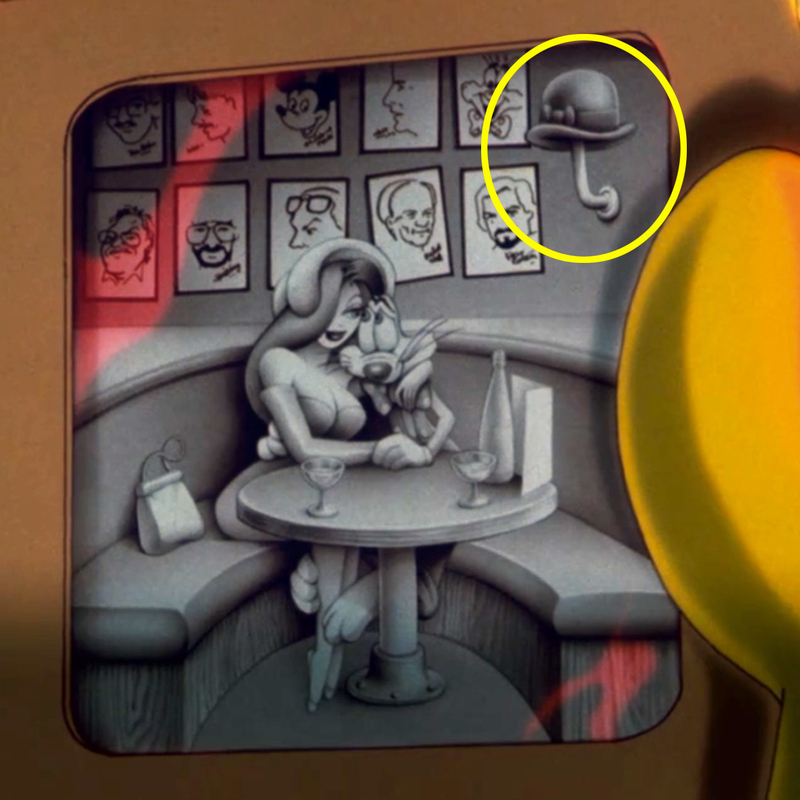 Also, you can see Roger and Jessica are meant to be dining at the famous Brown Derby restaurant — as noted by the Brown Derby wall sconces. 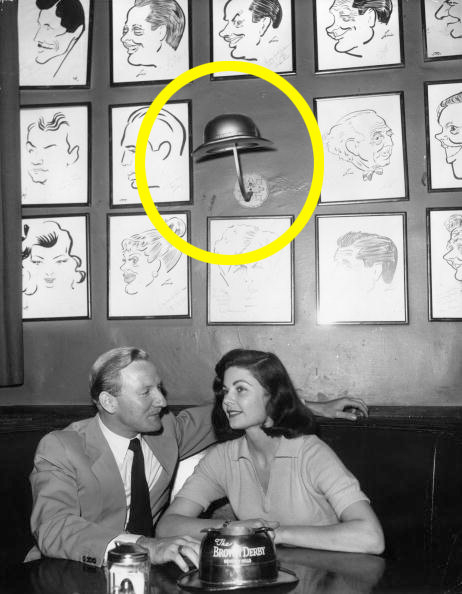 The Brown Derby actually had several locations in its heyday, but the most famous location — the one shaped like a hat — was called "one of the crown jewels in the LA restaurant scene." 7. There's a Betty Boop doll on Teddy's (Eddie's brother) desk. Valiant & Valiant probably worked on a case for her in the past — which explains why she's so familiar with Eddie when he comes into the club. 8. There's also a photo of Eddie and his brother as kids working as circus clowns — this setup pays off at the end of the film when Eddie uses his old clowning ~skills~ to distract the weasels. A plaque above the photo reads, "Eddie & Teddy On The Road With Dad, 1906." 10. And the shoe that gets "dipped" was voiced by Nancy Cartwright (aka Bart Simpson!) — although, she went uncredited. And just a year before landing The Simpsons in 1989. 11. Roger and Benny the Cab are voiced by the same actor, Charles Fleischer. He also voiced a couple OTHER characters in the movie. 12. The tunnel to Toontown is the same tunnel director Robert Zemeckis would later use in Back to the Future Part II, which came out the following year in 1989. It's called Mount Hollywood Tunnel and it is located in Griffith Park, Los Angeles, CA. 13. And there's a sock and buskin (comedy and tragedy masks) symbol made from Felix the Cat's face above the tunnel entrance. Felix the Cat, a star of the silent era, was the world's most popular cartoon character before Mickey Mouse. 14. Eddie's toon gun comes in a box inscribed by Yosemite Sam that reads, "Thanks for getting me out of the Hoosegow." 15. The truck Eddie crashed into in Towntown says, "Acme Overused Gags" and carried things like bowling balls, bananas, and a piano. Ya know, things used for slapstick comedy. 16. There's even a pair of Mickey Mouse's...SHORTS? 17. Also, there's a salon for HARE cuts in the background here with the image of a hare about to be decapitated. 18. There's a message written on the men's room wall that Eddie hides in that says, "For a good time call Allyson 'Wonderland' — the best is yet to be." WHERE'S THE PHONE NUMBER THOUGH?! 19. If you have a dirty enough mind, these posters in the ~seedy~ Toontown alley are...QUESTIONABLE. They read: "Brer Bear, not too hard, not too soft, he's juuust right!," "Gregory and his rubber band, coming soon!," and "Porky's all beef sausage." 20. There's a "Cartoony" newspaper with the headline, "Bob Z Has A Winner" — a reference to the film's director Robert Zemeckis. 21. And, hey look, you can see Cinderella's glass slipper in the background here! 22. When the toon train hits the Dip Machine at the end of the movie, the windows in the train depict scenes of death and violence. You can see things like people pointing guns and axes at each other, a person choking another person, and even a person hanging — WTFFFF, right? 23. And finally, Kathleen Turner — who famously provided the speaking voice of Jessica Rabbit — actually went uncredited! Crystal Ro / BuzzFeed / Buena Vista / Warner Bros. Although, interestingly, her "performance model" Betsey Brantley did receive credit. Get Who Framed Roger Rabbit on multi-format DVD & Blu-Ray on Amazon for $9.49.